Kenmore has over 100 years of experience in the home appliance world. They are known for being great innovators and their products have won some prestigious awards. It’s no wonder they know how to make a great vacuum cleaner! But is the Kenmore Progressive Canister Vacuum Cleaner. The 21614 has a sibling – the 21714. 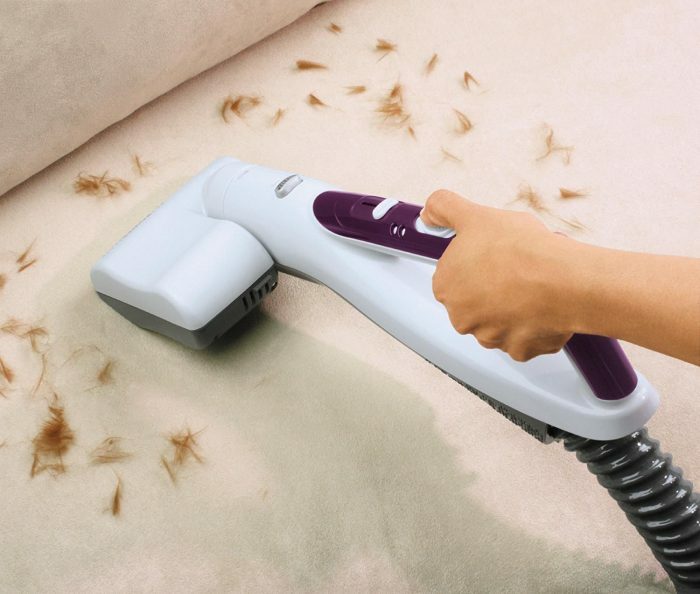 The 21714 has slightly more advanced technology, including an infrared dirt sensor, which is great for more robust cleaning jobs. However, it is quite a bit more expensive and for us the 21614 represents better value for money. 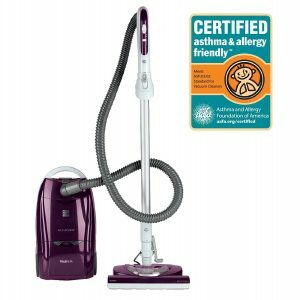 Which is why we are recommending it as the best mid-priced canister vacuum to buy in 2017. This is a good-looking vacuum cleaner. The outer case has a sleek, almost reflective shine to it, and the deep blueberry/purple color is gorgeous (of course, color is a personal thing but I love it) The hose and wand are a nice grey/silver shade which gives a sophisticated look. I like how everything is nicely contained and neat-looking, without too many details and “bits”. The top handle is a nice size and makes for easy transportation. 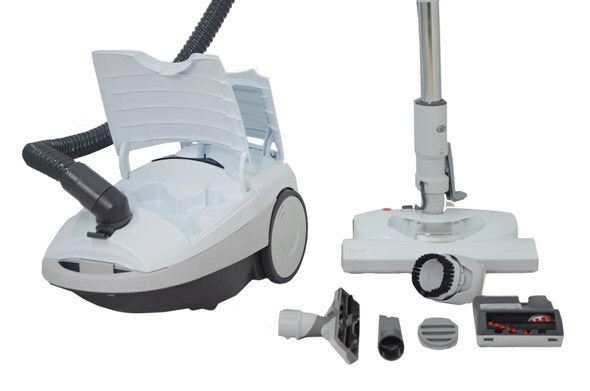 This model uses motorized cleaning technology, and has a 1320 wattmotor, which is about average for a canister machine. There is a power control feature which lets you adjust the power according to the job at hand, i.e. you might want to switch to the low power setting for delicate fabrics such as curtains and plush chairs. One of the unique design features of this model is the trademarked Stair Grip feature, which makes this an ideal choice for those with stairs. 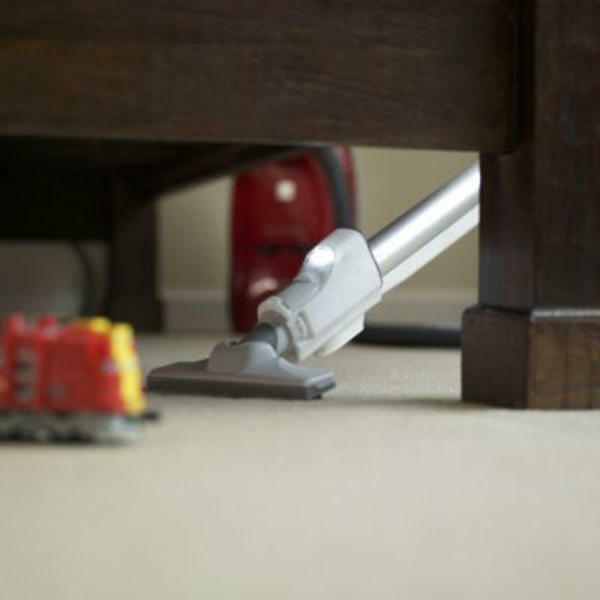 This feature allows the body of the vacuum to sit securely on the stair as you clean. I like this feature a lot, as I know how awkward it can be to battle with a runaway vacuum as you are trying to get the stairs clean! This vacuum has been designed for both hard floors and carpet. It has a crossover handle which allows you to switch between floor-types easily, and without constantly bending down, (basically, you press a button at the top of the handle, where your hand is already positioned). 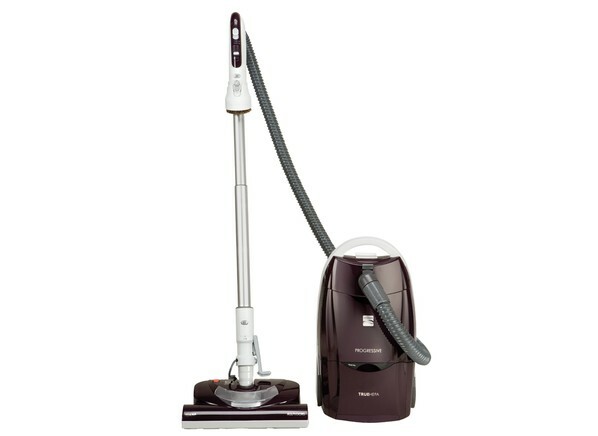 Kenmore has a pet hair and dander attachment called the Pet PowerMate, which is included in this model. 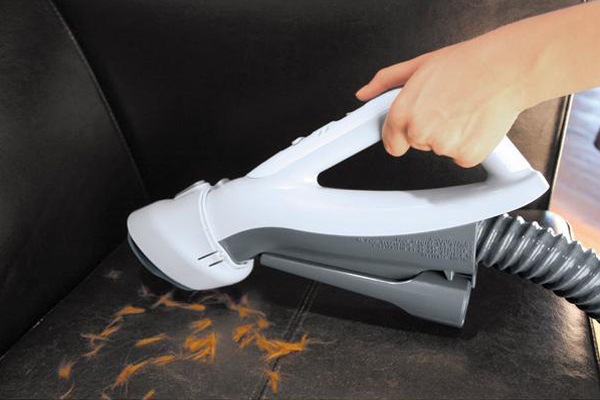 The attachment is designed to lift stubborn pet hair from all different surfaces, including upholstery. The size and shape of the attachment means it’s great for getting hair out of crevices and corners. 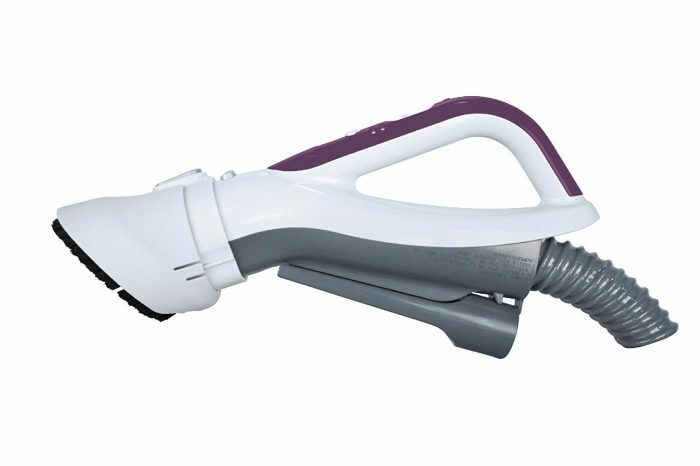 The neat thing about this model, is that all attachments are stored in the machine itself, whether in the wand, or in a special compartment in the body of the machine, which makes things much easier when you’re moving around the house. In terms of easy-use, this model rates pretty highly in my book. 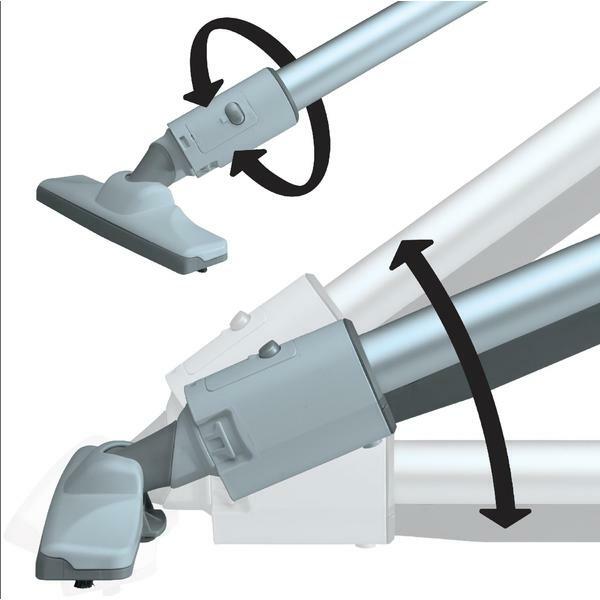 The crossover handle feature means you can switch quickly between floor-types without bending, which saves time (and your back!) in the long run. The smartly-designed storage of attachments is great because you can clean different areas as you go along, without having to race back and forth from the cleaning cupboard. Some tools, such as the crevice tool and dusting brush, can be activated by the press of a button, and don’t need to be physically attached. The power cord is 28 feet, which is quite generous, and ideal for medium-large homes. The hose is also a generous length, at 7 feet. It can be adjusted of course, to suit different heights, but it can reach ceilings, goodbye corner cobwebs! The machine weighs 23 pounds, which is heavy compared to some other models. If you have trouble lifting, this might not be the best choice. However, if you have no troubles with lifting or dragging, the weight won’t be an issue for you. It’s actually a benefit in some ways, as it means there is enough weight in order to keep the machine’s stair grip feature safely lodged when cleaning stairs. It also has an Electronic Performance Indicator which lets you know when the bag is full or if there is a blockage! I will say that this is not the quietest vacuum cleaner – anyone else, anywhere in the house, will be in no doubt that you are vacuuming. The bag holds around 0.8 gallons of dust and debris. While not as large as some rival models, this is about average for a bagged canister. How often you have to replace the bags will, of course, depend on the size of your house, how much shedding your pets do and how much dirt gets trampled in every day. Therecommended bags for this vacuum are the Type Q cloth bags. Cloth bags are more expensive than paper ones to replace but are much better for keeping allergens and dust locked inside the bag. The 21614 performs well on both hard floors and carpets and performs particularly well on deep pile carpets. The different attachments and bristle-lengths cater to different surface needs well. If your home has a mixture of linoleum, carpets, curtains, upholstered furniture, then this is a good choice for you, as you can adjust the power strength to protect delicate surfaces. I would say that while it performs okay on bare floors it really comes into its own on deep pile carpets. Pet PowerMate: this tool lives up to its name. You attach this tool when you need to get some serious pet hair removal going. It is gentle enough to protect your furniture, but tough enough to grab and store pet hair and dander from all surfaces. 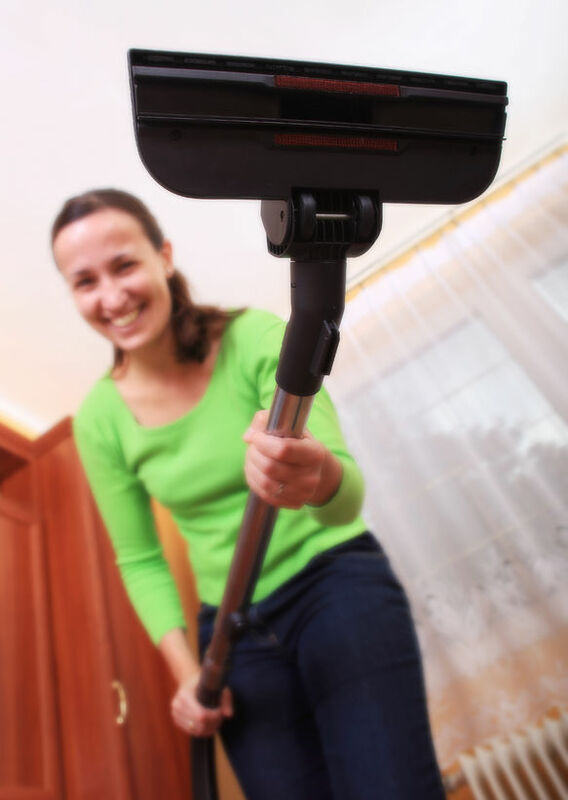 The crevice tool gets right into tight corners and crevices and the dust brush lets you get into other places where dust likes to build up, such as vents, cupboards/cabinets and behind the TV. And don’t forget the stair grip – more a feature than a tool – but worth mentioning again as it really does make it much easier and safer when you’re cleaning stairs. Bagged vacuums have always had a reputation for being better at keeping more of the dust in the cleaner and not sent back out into the room (although some modern bagless vacuums are equally effective at this). In addition, the Kenmore Progressive also boasts a HEPA filter which means even more allergens and harmful particles are captured, so you can rest easy if you have family-members with asthma or allergies in your home. I would recommend the Kenmore 21614 Bagged Canister Vacuum Cleaner for those with a medium-large home, with a range of floor-types and stairs, and particularly to anyone with the deadly combination of pets and deep pile carpets. The features included in this machine are ideal for those who want to give their home a top-to-bottom clean, as you can reach ceilings and high-up places with the long wand. But if you have issues with carrying heavy items, I would recommend you look for a lighter option, as this one is quite sturdy. If you’ve got pets and deep pile carpets – and can manage a heavy cleaner then the Kenmore Progressive is an excellent mid-priced choice.